From Performing Arts Centers across the North America, to Community College venues, major University Performance Halls, and more, IAIP has been producing innovative and exciting cultural programming for these markets for over thirty years. In conjunction with our booking agents, IAI Presentations has the international attraction you are looking for to round out your Performing Arts Series! Click on the links at right for more information. "Wow! 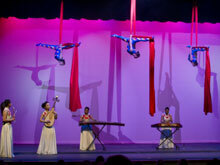 The Peking Acrobats once again thrilled our near-capacity audience at the Marin Center in San Rafael...These amazing artists are beloved in Marin!" 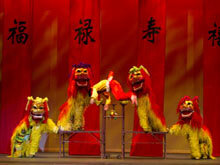 "You are in for a treat with the Shangri La Chinese Acrobats! They did a stellar show, our sold out audience loved them. Best of luck with the rest of the tour!" "The President and Mrs. Clinton join me in extending many thanks for the time and talents of The Moscow Boys Choir which greatly contributed to the beauty of the White House this Christmas." For more information and tour scheduling for THE PEKING ACROBATS and our other Chinese shows, please contact our booking agents, IMG Artists, Mr. Dean Schultz at (212) 994-3533 and by e-mail at dshultz@imgartists.com.